HMH Books for Young Readers, 9781328850898, 272pp. A funny new middle grade series about three 12-year-old best friends who start a babysitting club in their small California town. Perfect for fans of series like Whatever After and the Dork Diaries. Once upon a time, a girl named Kristy Thomas had a great idea: to form The Baby-Sitters Club with her best friends. And now twelve-year-old Malia Twiggs has had a great idea too. Technically, she had Kristy’s idea. (And technically, little kids seem gross and annoying, but a paycheck is a paycheck). After a little convincing, Malia and her friends Dot and Bree start a babysitting club to earn funds for an epic birthday bash. But babysitting definitely isn’t what they thought it would be. Three friends. No parents. Unlimited snacks. And, okay, occasionally watching other people’s children. What could possibly go wrong? Caroline Cala is a writer and editor residing in Brooklyn. She has worked as a book editor and as a ghostwriter on a number of books by notable people. Her work has appeared in Vogue, ELLE, Refinery29 and others. 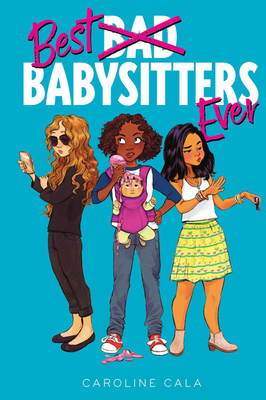 Best Babysitters Ever is her middle grade debut. Visit her on Instagram @CarolineCala.